It seemed like just a couple of days since our victory at Buckmore Park, but in reality it had been a few weeks and now the pressure was really on. Round 2 took us to sunny Dorset for a blast around Clay Pigeon Raceway – a track that I’d never driven and, even worse, neither had James. So with that thought rattling around my head our pre-race chat basically involved playing down our chances and murmurings that if we “bag a podium it’ll be a miracle”. To add insult to injury, it was also my turn to qualify (and start) so the pressure was really on – particularly as this is something I’d never had the pleasure of doing before in a Club100 race. Happily there was very little time to hang around looking nervous and feeling like it was my first day at school – James’s practice session ended and in I jumped. 20 minutes later we’d qualified way down the grid and things were starting to look like the smiles of Buckmore would be long, long forgotten. 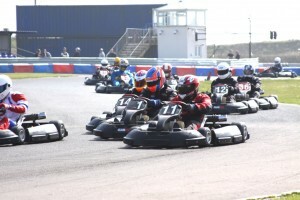 The gap, however, was reasonably small and from previous experience I knew that we’d be in with a great chance if we could keep the kart pointing the right way… so, sat on the grid and throughout the warmup laps I was thinking one thing – get to the inside, stay there, and let people spin out around you. Which is exactly what happened. Through the epic cloud of smoke and fumes I kept it steady – no silly moves, no weaving, just sitting on the inside of the first few corners and watching out for anyone intent on sticking me in the tyre wall. And that’s pretty much how we stayed for the whole race. No spins, no black flags, great pit stops, and an ever-increasing bit of race pace as we got used to the nuances of the circuit. Just under 2 hours 15 minutes later we were running 2nd in class and getting ready for the final lap – something that I never in my wildest dreams thought would have been possible. Sadly it wasn’t. We’d decided to be cautious but James had taken this a little bit to heart and, unbeknown to me, was being quickly caught. I should have been watching more closely at the lap times (for any rookies reading this, we won’t make the same mistake again) but, with just a couple of corners to go, he was overtaken and we ended up 3rd. Still though, a podium slot on a track that we’ve never driven before… that’ll do me nicely! Next up is Glan y Gors in North Wales on the 21st April. Also, don’t forget to check out our review and guide of Clay which includes some images from the weekend.